Even though he was out back then, Charles Perez's time hosting his self-titled talk show in the '90s was relatively scandal free. After the show wrapped in 1996, Perez transitioned into the role of television journalist, working for the program American Journal, and then serving as a weekend anchor on the number one station in the country's largest market, New York's WABC. In 2008, Perez was named main evening anchor at WPLG in Miami — a job he says was a joy until bad publicity, regarding an ugly break-up with an ex-boyfriend, began rearing its head. Perez says his bosses become anxious about the headlines surrounding his personal life, called him "too soft," and then pulled him from the main anchor desk. After filing a complaint under the Miami-Dade Human Rights Ordinance, Perez was fired; WPLG says it had nothing to do with Perez being gay and, since the scandal erupted in 2009, the complaint against WPLG has been dismissed. 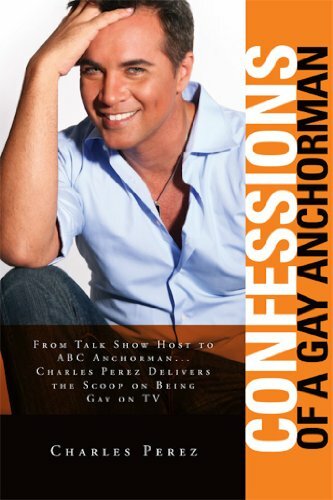 Perez's tumultuous time at WPLG, along with his entire career in front of the camera, is documented in his new memoir, Confessions of a Gay Anchorman. Happily married and with a new baby daughter, Perez talked to The Advocate about his book and why it's so hard for some television journalists to come out. The Advocate: Why did you want to write the book? Perez: I would not change anything about how my life has unfolded—I have an amazing husband and a beautiful daughter. But when I parted with my last station, WPLG in Miami, which, up until the end, was a great relationship—I felt like two things finally collided—Charles Perez, the TV anchor personality, and Charles Perez, the gay man. And when they did, I felt like fate put me on that intersection and I had to deal with it. It had been a long time coming. How have people reacted to the book? I think there’s two reactions—I stay away from reading things online; lots of people have lots of opinions and I have no power over what people think and they have a right to their opinion. But especially with the book, many people with opinions haven’t read it yet. Facebook is a great example—a lot of people have started reaching out to me, particularly young gay men. Most of all, I wrote the book because I thought we have to erase the shame associated with being gay. It’s time for gay men to have our own Rachel Maddow, if you will. There are lots of examples of gay men on television, thank God—there wasn’t when I was coming out in the '80s. But even though that changed, I do believe there’s still a ceiling. I think that’s really disconcerting and I wanted to put a spotlight on it. I know that makes some people uncomfortable, but nothing changes until it changes. In the book, you mention a newspaper article that had the headline, “Charles Perez, Too Gay for WPLG?” How strongly did you feel there’s a limit on journalists’ "gayness?" I give an example in the book of a co-worker who called one of our meteorologists “too gay”; he needed to be tempered. First of all, [the gay man] was a great meteorologist. Bottom line. And that’s the other message of the book—as Martin Luther King said, we should be judged on the content of our character. We should also be judged by the quality of our work and our results. But in today’s corporate culture, particularly if you’re on camera, you’re a commodity. Being gay is still considered by the top brass a liability. They’ll take that shot with you if you’re a reporter in the street or if you’re a morning anchor, but if you’re the main evening anchor that they’re putting their image behind—not so much. This is true at a local stations and at a national network. [Executives] might be OK with it, but there’s an unspoken expectation that you will not only not lead with it, but you will allow the misperception that you’re straight to be perpetuated. Does Joe the Plumber, et al, care if he gets his news from a gay anchor? I don’t think they care. And if they care, they care for a moment and then they’re more interested if you’re doing a professional job. I think the fear comes more out of advertisers and out of television executives who are afraid what advertisers will think. Ellen DeGeneres is a great example, if you go back to her sitcom. When she came out, there were great ratings, everything was fine, and then unfortunately advertisers started to pull out and ABC didn’t stand with her; they dumped the show. I think in the long run, Ellen and Rosie O’Donnell and Rachel Maddow have proven the case—if you’re good, no one cares. But I think there is a double-standard with men. The Celluloid Closet put a spotlight on how gay men were only allowed in films as jesters or clowns. There are a lot of great people who are on TV today and accepted by management and their colleagues, but there also sort of the role of “Jack” on Will and Grace. That’s unfortunate and needs to change. We can’t be that narrow; our community is broader than that. Florida Baptist Witness that he’s interesting in enforcing the gay adoption ban that was struck down last year? not over until it’s over. And this is an example, like the TV business. hurts people like our daughter. thought, That’s a good use of your time. longer OK for someone like Joel Osteen to say homosexuality is a sin. antigay stance, they do that. How important is passage of the Employment Nondiscrimination Act? Frank, felt the wind just leave their sails. But [ENDA] is not dead.